The generic epithet is from the Greek gramma = letter and phyllon = leaf and refers to the conspicuous markings on the floral segments. Grammatophyllum speciosum is a large to giant sized orchid, hot to warm growing epiphyte on a big tree and occasional lithophyte occuring in lowland forests near streams and rivers at elevations of 100 to 1200 meters. 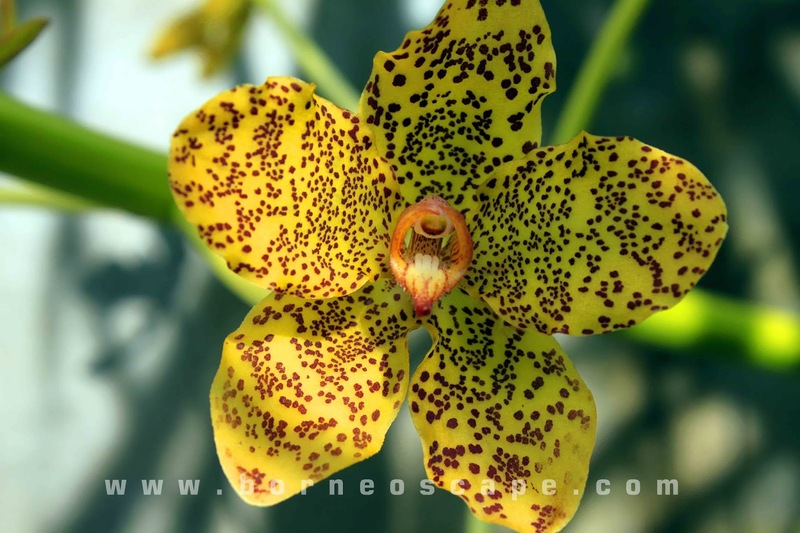 Spread in Myanmar, Thailand, Laos, Vietnam, Malaysia, Borneo, Java, Moluccas, the Philippines, Sulawesi, Sumatra, Bismark Islands, Papua and New Guinea and the Solomon Islands and is recorded to be the heaviest orchid in the world and is capable of becoming huge in cultivation. Grammatophyllum speciosum is a large, clumping, epiphytic orchid. Its stem is 3 m or longer, and up to 5 cm thick. It is also the largest orchid species in the world. They have erect to spreading, very long, cylindric, yellowish with age, many ridged and noded pseudobulbs enveloped completely by leafless and leaf-bearing sheaths and carrying thin textured, distichous, linear or ovate, obtuse or acute, decurved in apical half leaves that are articulated to the basal leaf sheaths. Leaves that go well up the stem giving them more of a palm tree look. The flowers blooms every 3 to 4 years and can last up to 3 month. Its 10 cm-wide flowers are borne on an elongated shoot from the base of the stem. Both its sepals and petals are pale greenish-yellow with orange-brown spots, turning darker when older. The floral stalk is about 2 m, basal, erect to arching, racemose, many flowered inflorescence that carry 30 to 50 sometimes fragrant, waxy, successively opening, long-lasting flowers with the lowest flowers being imperfect and distant. Fruits are pear-shaped with about 15 cm long. 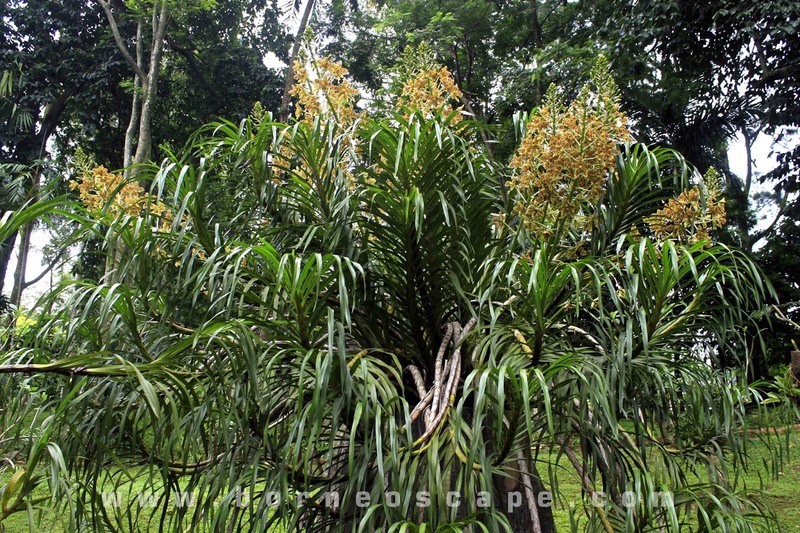 Grammatophyllum speciosum is best grown as an epiphyte, but it can also be planted in the ground or in large containers. To grow it as an epiphyte, it can be tied to the trunk of a large tree near the crotch. 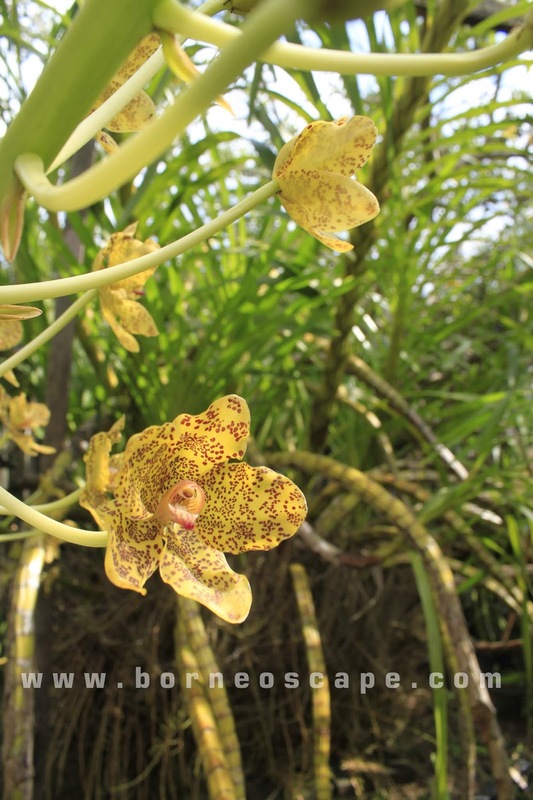 It is the largest orchid species in the world with specimens growing up to 2 tonnes and bearing up to 7,000 at a time! It is often grown as an ornamental orchid in gardens and parks for its attractive foliage and large flowers. Grammatophyllum speciosum can be used as focal point, Roadside Tree / Palm, Parks & Gardens, Small Gardens, Green Roof, Flowerbed / Border.